For example, while our Muscle Recovery formulation relies heavily on the 250mg of high-grade organic CBD for its effectiveness, other key essential oils have been strategically added to increase benefits for sore muscles. Whether your muscle soreness is from a great outdoor adventure, gym session, strain or injury, clove essential oil gives additional relief benefits to our CBD Muscle Recovery salve. Clove can relieve chronic inflammation and autoimmunity. Clove oil stimulates blood vessels and eases tension, not to mention it has great aromatherapy properties! Another key essential oil that is useful when treating muscular and joint pain is nutmeg essential oil. As with clove oil, nutmeg is an anti-inflammatory. Are you starting to see why we’ve chosen these essential oils? When you need to cool down after a hard workout or strenuous activity, or when you are suffering from inflammation for whatever reason, a natural sedative like orange essential oil helps you relax. Orange essential oil provides quick and effective relief from internal or external inflammation. Orange essential oil can reduce irritation and pain. 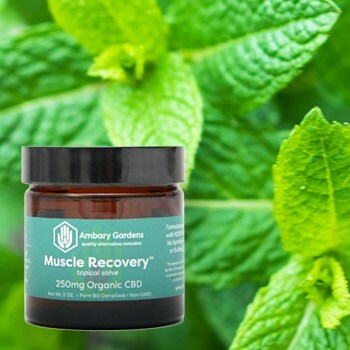 You know that familiar warming sensation you get when you apply Muscle Recovery CBD Rub? That is attributed to the peppermint essential oil. Peppermint oil releases tight muscles and relieves sore muscles when used topically. It’s also another reason for the wonderful aromatherapy properties. Is Deep Rub Really Different from Muscle Recovery? YES! Deep Rub is a completely different formulation designed to cool the joint with CBD plus essential oils of Lavender, Camphor, Rosemary, and Eucalyptus. We’ll cover those benefits in another article. Sure, we could have added something to our salve to make it smell pretty and you’d still get great benefits from the organic CBD but we didn’t want to stop there. We strive to pack all of our products with as many relieving ingredients essential oils as we can so that you get the most relief possible. Have questions or comments about CBD and essential oils, or any of the ingredients we’ve used in our Muscle Recovery formula? Please comment below or call one of our CBD Specialists at 855-426-2279. We love answering your questions and helping you determine the best options available to you, even if they aren’t ours.